Penk announced his decision live on air and will pass on Breakfast show duties to Elliot Eastwick. After purchasing the station in 2008, Penk spent five years on-air at the station. During his presenting time, he was able to double the stations audience within three years. 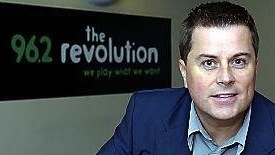 The new schedule puts Big Al, who was sacked from the station in 2011 after an apparent fall-out, back on a daily show, followed by Brendan Kearney on drivetime.